Now that the first couple of Mods have finally been completed I figured she's worthy of a little build thread. Excited to continue the progression into overland duty. Always been a Toyota guy and will likely end up back in an LC down the road, I just couldn't get the idea of a G Wagen Overland build out of my head. She Performed beautifully on the 1250 mile trip home. They get such a bad rep for their on road performance, I went in with extremely low expectations. While the fuel economy was nothing to write home about I was really impressed with how solid and planted it felt even at a couple of extended 85ish mph stints. All in all I wont hesitate to put in some long highway miles in the future. Overall stoked with the new stance. No significant sacrifices in on road performance felt yet. Was worried the tires would look over-sized without a bit of a lift but I'm now kind of digging the way she currently sits. No rubbing issues yet on the street, we'll see how it fairs on the trails once the snow melts. Excited to get a good off road shakedown in then continue the build. Welcome to the party. I think the trucks handle really well on long drives. When handling starts to suffer it’s a sign that maintenance has been delayed. Usually it’s wheel imbalance, work suspension bushings or worn steering joints. Pretty easy to address all those things. Agreed Metric, it's been refreshing how simple most of the mechanics are. Expensive parts for sure but everything is relatively straightforward. Just hoping to stay lucky on the electronics side of things. 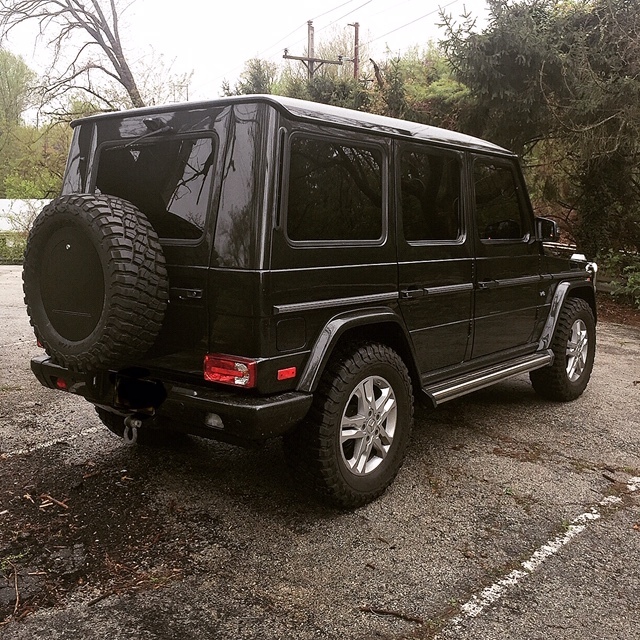 Added the gwagenaccessories spare tire cover. Super slick solution to the exposed rear tire that the OEM cover no longer fits on. Love the look and added storage. Torn on whether to paint it body color or leave as is. Finally found a little dirt. Beautiful scenery. I was fortunate enough to spend a part of my college career in CO. Those trails never get old. Have you experienced any ESP issues since you installed the larger tires? Thanks, I've only been out here for a couple years now and love it. Spring can't get here quick enough to melt a little of the crazy snowfall we got this year. Excited to get to more trails. I didn't have esp issues at all in normal city/highway driving after getting the new tires on. I finally put it through the true test on the way to those trails above; on exceptionally twisty mountain roads at a good pace I had some unnecessary engagements. It seems to be greatly exaggerated when there is any uphill or especially downhill grade. I must admit it was quite annoying. I Haven't changed the diff settings to help compensate yet, but expected I'd have to eventually. I wanted to get a baseline of how bad it was before changing any settings. I still plan on a 50mm lift so I'll probably hold off on changing anything till then. Have you changed the tire profile setting in the G's star diagnostics menu? this will adjust the ESP, speedo, etc for the proper tire size.